Quilters can make quick work of their entire quilt cutting with one easy movement. Simply cut, rotate, & cut again for quick, effortless results. Efficiently cuts squares, triangles, diamonds, circles, any shape which would ordinarily require you to turn your project or your body around. 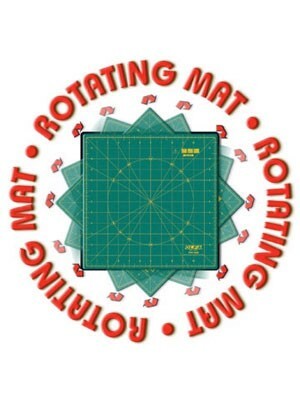 The Rotating Mat's smooth rotating action simplifies your piecework when making multiple cuts, saving time & effort for you. Eliminates the need to turn your body, or work your way around a project.